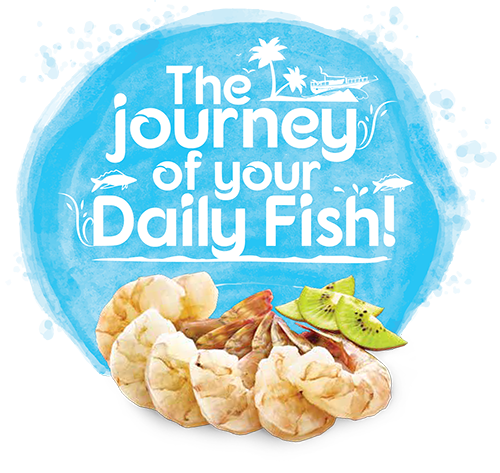 This is the story of the great tasting fish that reaches your doorstep everyday from Daily Fish Kerala's finest online seafood store.Behind every authentic fish that reaches your doorstep lies a legacy of 49 years of International quality seafood export from the house of Baby Marine. Why we deliver to your doorstep and not in Stores? The Quality of your fish starts deteriorating once it is out of the water and this is where Cold Chain is of utmost importance to maintain the Quality and Food Safety of your fish. It is important that Frozen or Fresh fish bought from stores need to be kept in insulated bags properly packed with ice as per following suggestions. Fresh Fish bought from stores – Normal ice or Gel ice can be used. If not, the temperature will rise above +4.4°C and becomes favourable for Bacterial growth. This will lead to quality and food safety issues. 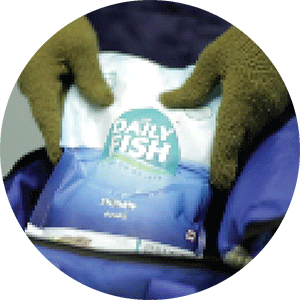 Frozen Fish bought from stores – Gel Ice is recommended along with insulated bags. If this is not followed, the frozen fish will start thawing. After we reach home, in most cases we keep the frozen fish back inside freezer compartment of the fridge. The partially thawed fish now regains firmness. The temperature fluctuation happened due to the above, severely affects the Taste and Texture of the fish. 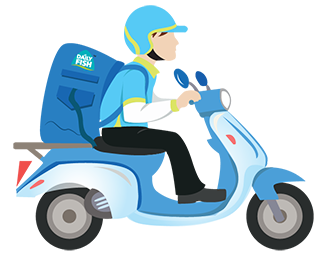 Daily Fish by delivering your fish to your doorstep, complete the Cold Chain process from deep sea to your door step, ensuring both Quality and Food Safety. What is Bacterial Growth and how does it affect the Fish? Bacteria is present everywhere and never start from Zero. When the fish is above +4.4 degree Celsius, Bacterial Multiplication takes place and this happens every 20 minutes. For instance, if the initial count is 50,000 per gram, it multiplies to 1 lakh in 20 minutes. If this temperature abuse continues, it again multiplies from 1 lakh to 2 lakhs to 4 lakhs to 8 lakhs and so forth at every 20 minute interval. This natural growth of bacteria above +4.4°c causes damage to the Nutrients which affect the Quality leading to bad taste & bad texture. Extent of this damage causes Spoilage and makes the Fish Unsafe for consumption. Cold chain is a temperature-controlled process whereby the fish is kept under +4.4°C to prevent damage due to bacterial growth from the time your fish is caught till it is delivered to your Doorstep. Our strength for the last 49 years has always being the procurement of fish directly from the fishermen. We source only the best quality fish below a core temperature of +4.4°C, using imported temperature recorders to avoid natural bacterial multiplication. The sourced fish are transported to our nearby air-conditioned processing factories, which are strategically located right next to where the fish is caught, to keep the fish at the best quality. Our processing factories are all air-conditioned at an optimum temperature to maintain the core temperature of +4.4°C in the sourced fish. At the processing factory, the sourced fish is immediately deep frozen to -40°C using imported freezers. This helps the fish attains a core temperature of -18°C, which arrests all further growth of bacteria. The fish, with a core temperature of -18°C is then transported in refrigerated trucks to various delivery hubs located at strategic points. This helps us to make last minute delivery to your door step as quickly as possible, maintaining the core temperature and nutrients of the fish intact. All the fish are stored at -18°C in the distribution hubs. Each hub is connected with an Auto Back up Generator, which automatically starts in case of power failure, in order to ensure the core temperature and safety of the fish. Your fish is delivered at your door step in delivery bags which are custom designed with imported temperature recorders and tested to withstand the temperature fluctuations up to 5 hours. Fish is termed frozen only if the inside/core of the fish attains -18°C. -18°C can be achieved only if the fish is passed through Commercial Freezers that has the capability of achieving –40°C. Daily Fish uses only Commercial Freezers that freeze shrimps/small fishes in 7-20 minutes and large fishes in 3.5 hrs. Daily Fish freezing equipment also includes imported IQF freezers that have the patented “Impingement Technology”. This technology fitted freezer freezes from top and bottom emphasizing on the efficiency of the freezing. Freezing is the 4th step of maintaining Cold Chain. Freezing ARRESTS further growth of bacteria. Arrest of bacteria will lock the nutrients intact. This retains Aroma, Taste and Texture of your Daily Fish. Freezing thus becomes the most important part of Cold Chain, as most of fishes sold in local markets travel long distances as far as Mumbai, Gujarat, Vishakapattinam, Mandapam, Tuticorin, Kanyakumari, Kochi, Kozhikode & Mangalore. It is also proven that freezing helps to improve the shelf life of your fish. Why do we use double packaging? The inner Vacuum packed bags are the most important as this stops the exposure of your fish to air. Vacuum packing technique reduces atmospheric oxygen in Pouches, limiting the growth of bacteria and preventing the evaporation of volatile components. This makes our fish flavour locked throughout the shelf life during frozen storage. Our strength for the last 49 years has always been the procurement of Fish directly from the fishermen. We have strategically located our processing factories(as mentioned below) right next to where the Fish is caught to keep the fish at the best quality! Malpe, Karnataka which is just 50 metres away from India’s 2nd largest Fishing Harbour. 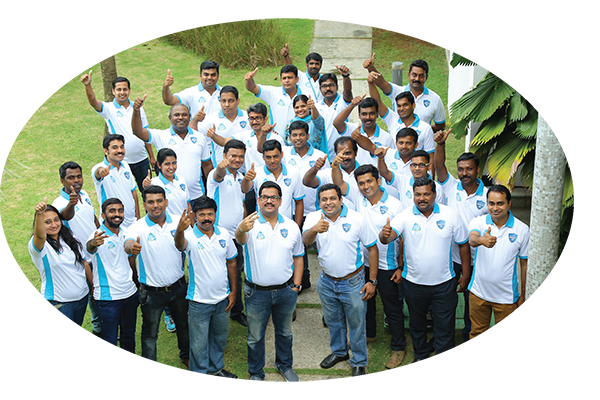 Kochi, Kerala right next to Thoppumpady Fishing Harbour is our 4th facility. To get the best Amberjack (Punnarameen) or Black Pomfret Mumbai coast is the best. India’s best White Pomfret is available in Gujarat coast. How do strategically located factories help? Our factories are located very close to the fish catch centres whereby, fish is best in quality. We can buy fish even in small quantities and do not have to wait for a full truck load. Fish in small quantities are transported to our nearby factories quickly so that our catch remains fresh. Every city has a ‘Distribution Hub’ where your Fish is dispatched. All your Fish is stored here at -18°c. Each Hub is connected with an Auto Back Up Generator which automatically starts in case of Power Failure. If due to any further break downs, and if the temperature falls below -18°c, we have a technology that sends an Auto SMS alert to our Food Safety Director for further action. We always ensure the safety of your Fish. All our Delivery Bags are custom designed, tested & certified to withstand the temperature up to 5 hours of your Daily Fish. A 5 hour Thermal efficiency study for our delivery bag design is tested and verified by CIFT(Central Institute of Fisheries Technology). This is why we have Delivery Slots only for 3 hours and even in case of a delayed delivery, our bags can withstand the delayed time. In addition to that, every Delivery Bag is numbered and checked for temperature withstanding capability with specially imported ‘Temperature Recorders’. Formaldehyde mixed with Ammonia are used by some traders to give a shine on the surface of the fish (just like the “shine” seen on a polished shoe). This gives a perception that the fish is fresh, whereas actually it is not. We have imported instant ‘Test Swabs’ to identify Formaldehyde which is one of the recent chemical hazards being found in fishes in local markets. In addition to this, we run specialized tests for hazardous chemicals through a sampling protocol at Internationally Accredited Laboratories. The freshness test that we do is again tested in internationally accredited laboratories. Microbiology Tests give you the count of different kinds of harmful bacteria. The fish supplied to you goes through Microbiology Tests at our in-house Laboratory as well as Internationally accredited Laboratories. Microbiology tests are done for the `fish before processing’ and on the frozen fish as per sampling protocol. We are certified with BRC (British Retail Consortium), IFS (International Food Standard), FSSAI (Food Safety & Standards Authority of India) and strictly follow HACCP (Hazard Analysis & Critical Control Points). We care for the environment and our factories have effluent Treatment Plants. The Waste Water is treated and recycled to grow Vegetables and for gardening. 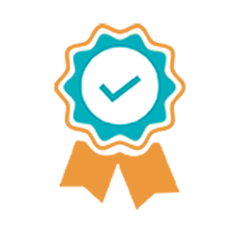 We will attend 100% of your Calls, even during non Office hours. We will address 100% of your Concerns. We will remain committed and travel an extra mile to give you a ‘Wow’ experience. In spite of all these measures, if the Fish you tasted is not up to your standard, we will replace the Product or Refund cash or Credit the amount to your Fish Wallet. At Daily Fish, we have a 24 hour ‘No Questions asked Return Policy’. We take pride in our Product. We are Dedicated and work with Passion.